ghd Air Kit (Diffuser and Size 3 Ceramic Brush) contains three of the most important styling tools you will need to achieve a salon-perfect hairstyle. The kit contains a hairdryer, ceramic brush and clips, and ghd Air Diffuser. 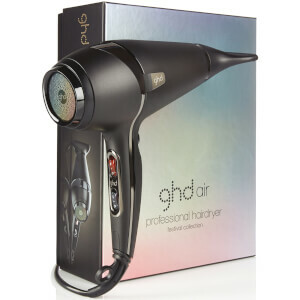 The ghd Air hairdryer has a powerful 2100W motor and advanced ionic technology to retain hair's moisture, while banishing frizz. The ghd Size 3 Ceramic Brush has a hollow, vented barrel to help you create styles with more lift and volume. 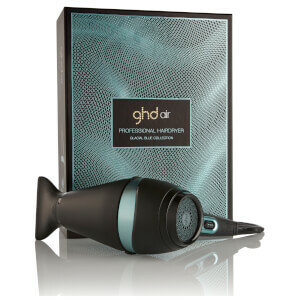 The ghd Air Diffuser will give volume and lift to naturally curly hair, without the frizz. A great bargain - my daughter will be really thrilled. Easy ordering and very speedy delivery. Perfect product and super quick delivery. Thank you! I'm really pleased with this hair dryer, it dries my hair really fast. I noted from some reviews that the dryer was a bit heavy, I don't find it SIL. The summer sale of GHD is really inspiring!!! I have been watching this hair dryer for a month, it's time to take it! At first, I was hesitating to choose between Air and Aura, Air has a high power with loud noise than Aura . But when I first use it, I feel air is just what I need, the noise is acceptable. After using it , My frizzy hair becomes more smoothy and glossy. And this kit with an advanced split end therapy as a gift is really worth to own it!!! 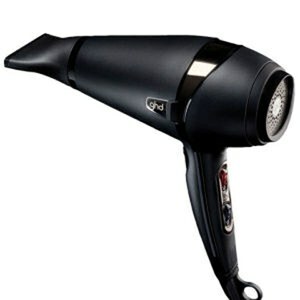 The hairdryer is no doubt a powerful professional hairdryer used in salon. It is considered very quiet for the strength of it. A tad heavy but it makes the hairdryer feels good to touch and screams of quality. Two speed and 3 heat settings with a cold shot button. Setting the hairdryer at the medium heat is good enough to dry my fringe in one shot. It definitely takes shorter time to dry my hair with this hairdryer. The accessories that came with it is of good quality and I love the diffuser head! So happy with my purchase!! Overall this hairdryer does the job of drying hair well and my curls form nicely. It has a nice long lead which is convenient. My one gripe is that attaching and particularly detaching the diffuser is a struggle as it is a snug push fit. The diffuser on my old hairdryer of 20 years used to attach by a small turn which is far easier to manage if you haven't got a very good grip for pulling things apart. Brilliant product. Good quality and worth every penny. I can have the choice now of straight or curly fuzz free hair.